I’m really hoping to get a 2nd dog in 2016, a puppy or young dog to be a running buddy. My husband and I have been researching all our options for the last 5 months. I’ve been in touch with breeders. I’ve applied through several breed-specific rescue groups. We’ve thought about shelters and even Craigslist. I have to say, the process is frustrating. I knew it would be hard, but I guess I was hoping to be surprised. Simply, breed-specific rescue organizations will NOT adopt out a dog to us. They are free to make their own choices, of course. They are independent groups. But it’s still hard to face rejection, especially as a successful self-employed person who works professionally with dogs. There are multiple reasons why we are rejected from adopting a dog time after time. The most common reason is because rescue groups call landlords to ask if cats are allowed, and we are not willing to announce to our landlord we have two cats. Read my story here. The good news, though, is that I’m a volunteer for a wonderful Labrador-focused rescue group that is not so picky. The group is thrilled to have us as a foster home from time to time (remember Lana? ), and we are welcome to adopt from the group when we’re ready. It seems to be the only rescue group that will approve us. I’m always scoping out this organization’s dogs, waiting for the right match for our family. We’re always eyeing the German shepherd mixes that come through. There is no shortage. I’ve also been in touch with a Weimaraner breeder, and we have been approved for a puppy from a future litter, most likely in May or June. Like the rescue groups, this breeder had me go through an extensive approval process that involved questions about my lifestyle and how on earth I will provide enough exercise for such an active breed in an apartment. This breeder listened to me and saw that I am a true runner (is 15 miles a day enough for ya?) and will be active with my dog, regularly attending training classes, hiking, visiting the beach, taking my dog everywhere. I’m excited she believes I will provide a good home. I’ll be in for a wild ride with a Weim, I know. I wanted to write this post now because I don’t want anyone to be shocked I’m working with a breeder. The thing is, a true dog lover appreciates good rescue groups, but she also appreciates good breeders. I will work with both throughout my life with dogs. Still, it’s no easy choice for me to consider buying a puppy. That’s why we’re taking our time and moving forward wisely. We have not made our decision on where to get a dog and are still considering other breeders and shelters. We do not need advice on where to get our dog. Obtaining a dog in any way should always be done carefully. It is not black and white. No one should ever feel guilty about obtaining a dog responsibly. I wanted to write this post months ago but didn’t want to get ahead of myself. We aren’t bringing a dog home for a couple of months yet, maybe longer. I’m just really excited and couldn’t wait any longer to tell you some details! Are any of you thinking about adding another pet to your family? How did you decide where you got your last pet? I’ve been very lucky in the fact that every dog I’ve ever had has come to me, so I’ve never had to go through the over-whelming process of choosing one. Now that I am involved in the rescue community, I can see how judgmental and contradictory the process can be. “Millions of healthy pets are dying; everyone should rescue! Well, except you. You don’t have a yard. Or you; you have a job. Now, YOU can have a dog! Wait, you want to have children in the foreseeable future? No dog for you!” There is a basset hound rescue that my vet helps out and I got all exited and started thinking about adopting from them, but they require a yard. Their loss. I am dead set on one day owning a basset or beagle, and if I have to go to a breeder, well, I suppose if it’s my only option I will. We got very lucky with our beagle Leia. We scooped her up from Dallas Animal Services the day she went up for adoption. She was 2 1/2 when we got her, and she is 4 years old now. This was our first dog to get that wasn’t a puppy. It was pretty nice to not have to house train or worry about puppy chewing! She has been a fantastic addition to our family, though I do have to say that she trained us to put up with some very beagle traits that we weren’t used to! It’s all about the nose with those cuties! That’s great to hear! Last Friday I was at a local animal shelter to meet a beagle that had also only been there one day and the family before me snatched him up! It’s nice to hear it’s possible to get lucky. I’d love to adopt from Beagle Liberty Project and I plan to try, but I’m worried their requirements are too strict. haven’t tried yet, though! I wonder if you could get on a waiting list with certain shelters or at least on a list to be notified when they have a beagle or other specific breed. I saw that option with one of the shelters in my area. You could get approved ahead of time and then be ready when the right dog comes along. Congratulations. This is an exciting time for your family. Thanks for letting us in the journey. I went through some of the same thought processes about 2 years ago – ready to bring in new dog, quite possibly puppy, not sure I’d find the right fit via rescue or shelter (though I have adopted from rescue and I have volunteered at shelters). Not sure how it would fit with older dogs, how I’d feel about puppy vs. starting at young adult (my past preference). I also had seen how life altering a “difficult” dog could be for my own home and many other people and became less willing to roll the dice on a 10+ year commitment for an adult dog that I couldn’t really foster and get to know very well before adoption. As for breeders, while I’m sure I would have found a good fit if I kept looking, I don’t have the time or interest in really competing or titling in any dog sports or activities, so many excellent and reputable sporting/working dog breeders would not have chosen my (otherwise wonderful) home, where dogs are loved and given physical and mental stimulation but no trophies. After looking at all the options, I decided to become a puppy raiser for a service dog organization instead. For me, that was the best way to have in my life an ethically bred, smart working pup of the breed(s) of my best lifestyle fit, while supporting a cause I feel strongly about. It was something I always wanted to do when I had a work schedule compatible with a puppy. And while it’s caused “puppy raising,” they aren’t really puppies for all that long of the time you have them. The pup is now around 1 & we have 6 more months before he goes to (advanced) school for assistance work. I hope he succeeds and goes on to have a career as an assistance dog for someone who needs it. I have no reason to think he won’t (behavior and training are going great – very easy dog as many of them are for this work). And unless something changes, I’ll plan to bring in another puppy once my guy goes off to college. If he doesn’t make it, I can adopt him and know I’m getting a wonderfully bred, highly-trained companion dog. I’m pretty new to this whole process, so maybe if I raise puppy after puppy with unfettered success (it does happen), I’ll get tired of not having an older dog around or only fostering and not keeping one permanently. But since the success rates for even the best programs are around 50-50, anyone who sticks with puppy raising long enough is likely to have at least one great dog in their home who wasn’t suited for the service dog life. For me, this was the right call. I’ve always been someone who travels with my dogs, trains them extensively, and expects them to be socialized and adaptable to changing circumstances and environments. I like taking them places with me, and I like being places where they are allowed to be. I also like retrievers, german shepherds, etc. – smart, biddable working dogs – and I’ve always looked to adopt ones with calm demeanors and medium energy for the sporting breeds. The things I value in a dog are almost exactly the same criteria used to breed and select assistance dogs. I also do not run or need my dog to grow into the joint pounding activity that many others would want (including you Lindsay) – just walking and moderate hiking (or riding in a bike trailer with me) is enough.There is pretty much no ethical breeder that could sell me a puppy which would be better suited for the type of dog I’d want to be around and raise than the puppies already being bred in assistance dog programs. That I get to participate in the process of prepping a dog to really make a difference in a person’s life is just a bonus on top of that. That’s really inspiring, Sean. I hope to do this at some point in my life as well. Appreciate Sean’s taking time is sharing experience. So exciting! I bought my German Shepherd from a breeder, and she has been one of the best decisions I have ever made. She is perfect for us and exactly the dog we wanted and more. She’s also exactly the dog the breeder predicted she would be. Not only is she fantastic, but we have also been fortunate to be part of a great community/extended family of puppy buyers who share tips, cheer each other on, and enjoy getting to know each other and one another’s dogs. What an exciting time for you guys! There are so much great benefits that come with buying a pup from a breeder; it isn’t just the puppy but also the relationships and support. Congrats to you guys! There are so many similarities between a good breeder & a good rescue group – they both do their research on who they adopt out to, not saying I agree with all of their policies. But I think it’s funny that since there are so many bad breeders out there it makes the few good ones look bad – which is so far from the case. It’s like there’s a line drawn between those who get their dogs from shelters & everyone else – and it’s sort of sad because there are so many people out there looking for a specific dog & go through a breeder – and they’re some of the most devoted pet “parents” I know of. Oh and as to how we made the decision? I was dying for a GSD and did a lot of research on the breed. My husband wanted a young puppy who would grow up knowing his cat was boss. 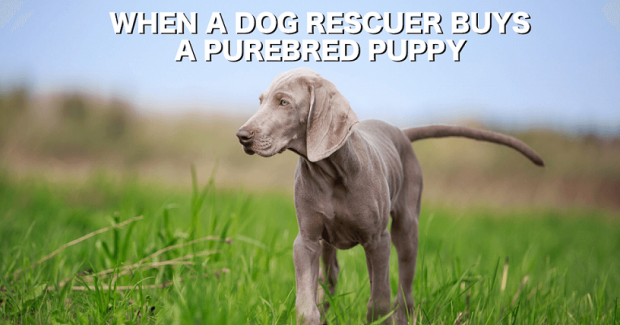 I felt that with a popular breed prone to health and temperament issues, I needed to know the pup had been carefully bred with an eye for both. Contrary to what some rescue people would claim, the pedigree isn’t about status for me but about being armed with knowledge. It became clear to us that a breeder was going to be the only way for both of us to feel comfortable. The more I learn now, the more I’m convinced a breeder was the way to go. I got a better dog even than I had hoped, because I chose a good breeder. If I get another shepherd, now we have contacts who know us and know our dog and how she’s raised; if we get another kind of dog, I have a gold standard against which to compare that breeder. It’s not easy getting the roght puppy. A good rescue group – they want to find the right home so the dog does not end up back in rescue. Responsible breeders – want their puppies to go to the right home for the same reason. I recently got a puppy. The breeder is a good, long time friend and I helped with the litter so I have known him since he was a few days old. My friend was very careful evaluating future homes and matched the other puppies to the best home for its temperament. Some people who wanted a puppy did not get one from this litter, not because they would not provide a good home, just the perfect puppy for them was not in this litter. I commend you for your work and dedication and know it will happen when the right puppy/dog comes along. I’m completely behind your decision. I, too, would be ineligible for most rescues since I have an indoor cat who is unvaccinated, even though I have literally spent THOUSANDS on my last dog earlier this year who had extensive health problems that eventually led to him having to be put down. 🙁 But apparently I’m not fit to adopt from a rescue. Whatever. I ended up adopting a 4 year old Aussie/GSD (maybe?) mix from a shelter who had been there since she was 6 weeks old. Very sweet dog who has major fear issues I’ve been working on ever since. Then (because I am crazy and need to stay off the Facebook pet pages) I ended up with an English Shepherd (very much like a Border Collie) who had just turned 1. She’s a great dog but very high energy and after spending a little time with her it’s very clear her 21 year old former owner left her in her crate most of the time and when she wasn’t in her crate her boyfriend spent too much time wrestling with her. So, more stuff to work on. To make a long story short, if/when I ever get another dog I will DEFINITELY be looking into getting a puppy from a reputable breeder, just because I don’t know if I have it in me to “fix” any more dogs. It’s a lot of work! And yes, not every dog from a breeder is perfect, but you definitely go into it knowing more about the animal than when you adopt. I love adopting and think it’s a great thing to do, but it’s very easy to bite off more than you can chew. That’s been one of the hurdles for me too. I don’t vaccinate my senior, indoor cats. I’m not gonna lie, I’ll never ever understand getting a dog from a breeder. I get the landlord & rescue group frustration. I myself had to squirm around the issue several times. But I feel like there is always an option to rescue a dog. Maybe it is nearly impossible to get a purebreed Weimaraner from a shelter or Craigslist so I guess my bigger question is why is it so important to get a purebreed? I am a die-hard pit bull lover and probably will never own another breed but I am just as happy with a pit-type mix of unknown origins. I don’t see any benefit to a purebreed dog. I respect other people’s decision as long as they take good care of their dogs but I can’t say that I understand it myself. Just reading some comments above and see common trends, shelter dogs have difficult issues & dogs from breeders you know exactly what you’re getting. I never get those statements! I’ve known several dogs bought as puppies from great reputable breeders with very sound parents who grew up to have a total screw loose, including my parents’ GSD. And I’ve know even more totally awesome problem-free rescue dogs, including my own shelter puppies. I can see both sides. I’ve known plenty of people (friends and family) who got purebred puppies from breeders only to turn them into pretty screwed up dogs due to poor training and socialization. I’d say all dogs have “issues” of some sort. I wish people would stop assuming that those of us who researched and bought don’t realize that we are taking a gamble. Everything is a gamble. But I consider that I was stacking the deck in my favor based on potential. And what do you know, I won the lottery! My GSD is an amazing, sound dog just like both her parents. I wouldn’t hesitate to go back; even if there is an issue, I would have good support from my breeder in resolving the issue or getting a different pup if something was truly so wrong that the puppy couldn’t lead a healthy, happy life. I don’t know why that’s hard to understand. I won’t defend myself for wanting a purebred dog, but I can see why it would be a hard decision for others or even impossible not to adopt. It’s not an easy choice for me either. I like Rachel’s comment that there is ALWAYS the option of rescuing or adopting a dog somehow. If someone wants to adopt and believes that is the way to go, there is always that option somehow. I just think there are so many potential positives to buying from a good breeder. I have been so lucky with my dog. I don’t understand how that could be wrong! If it’s what works for your household and situation, it’s a great option! I also reject the notion that it’s always possible to rescue. I wouldn’t have found what I was looking for in rescue even if that ever had been on the table. Our oldest daughter wanted to adopt a dog when they bought their house. But- they have a toddler, and they wanted a larger dog. Big no-no at a lot of rescues. Even though their son has been around large dogs since he was born (Mom was a vet nurse at the time, and did some dog walking for a few of the practice’s clients- a Rottweiler, a GSD, and a Lab). He’s known how to behave around big dogs since he could say “dog”. But, no dog for you because you have a small child. It was frustrating, and they were looking at breeders when they finally found a sweet Great Pyrenees from a rescue that evaluated them, not some list of questions. Molly has been so good with her little boy- gentle, and calm. When we lost our Lab, we started looking at rescues. Our issue was the yard- it’s big, but not fenced. And we wanted a big dog, too. So- we got a lot of no responses when the rescue found we had no fence. Even though I said my dogs are always leashed if not in the house (and they are). As if no dog has ever escaped from a fenced yard! But then we found a small local rescue that also evaluates the people. Adopting Lambeau was the easiest thing with them. It does sometimes seem that there are rescues out there who don’t think anyone is good enough to adopt. And it’s too bad. Lots of people would make good dog owners without fenced yard, with toddlers, or any other immediate disqualifiers. I know they want to place each dog in a home that will be best for the dog, but being overly stringent isn’t necessarily the answer. On the other hand, there are rescues willing to work with potential adopters to find that one right dog. Good LUCK!!! Congratulations!!! This is so exciting. I try not to look. Really, really try because we don’t need another dog. But D.O.G. does need a good big dog playmate and so we are talking about it. I’m sure in a year or two we will be ready but not right now. And I want a labradoodle or a standard poodle. Reason being is allergies. And I don’t mind spending the time grooming. Can’t wait to hear more about your process of picking out a dog. And good luck on where you get it. You’re right, this is exciting! I’m sorry. I thought this was a joke: Breeder and rescue. Sorry to say, in my eyes (and most true rescuers) they are two different things. We MURDER 4 MILLION dogs a year (just in the U.S. Alone) and that’s conservative, as not all shelters keep accurate statistics. There are puppies of every breed available for rescue- maybe you would need to wait, or accept less than a ‘pure breed.’ Human arrogance, self centerdness and greed lead to these deaths. All have their own justification or reason. To be a rescuer means you are standing for NO MORE KILLING. BUYING a BREEDERS puppy (many of which are puppy mill puppies- even when they say they are not), is not a rescuer thing to do. I’m sure this will cause ire & defensiveness and normally I will choose not to write something because of that very thing. But look the innocent ‘non purebred’ puppy in the eye that will die in the place of your ‘purebred,’ and let them know what you have to say. Because one will die in its place- every single time. Hi Kathy. Sorry to read such a hateful comment from you. Kathy, I would encourage you to think about how this comment paints rescue as a whole. I have heard everything in the last couple of years, since first making the decision to find a breeder: I am evil, I am selfish, I am shallow and frivolous for loving a breed when I should love dogs, I should be forced to go to the shelter and choose which dog gets the needle in the foreleg because I bought mine, you name it, I’ve heard it. You know what effect that had? I have pulled every dollar I had been donating to rescue or rescue related causes. I quit a volunteer job with a rescue. I will never rescue a dog and we are even considering a breeder for our next cat. The rescue camp in general has been so tainted for me that I go out of my way not to support it. And it’s all thanks to comments like this. So please think twice before you post. You could be losing supporters for your cause. Plenty of people will read this and not comment – some of them might quietly decide you’ve lost them. Just something to consider. Look on the positive side: at least there’s a camp that agrees with your decision! On the other hand neither breeders or rescues would be fond of me, because my dog was a free puppy. I hope you are successful in finding the right dog! I’d love to add another dog to the mix…The hubs says no, so we wait. In the meantime, I have the BEST running partner ever – my German Shorthaired Pointer…I can’t recommend that breed enough for running, and they are seriously the sweetest dogs too. 65lbs of lap dog. We got her from a reputable breeder local to us. Honestly, I think we made the right decision at that time to buy from a breeder. There is also a GSP rescue in our state who we will probably consider next time though. Good luck!! My struggle with both rescues and breeders was that they kept wanting a fenced-in yard. I finally adopted a dog that my next door neighbor abandoned. I’m hoping that when I want to adopt again, people will have some leniency when they see how serious, devoted, and committed of a dog owner I have been with Tonya. We wound up going with a non-breed-specific rescue group for our puppy a few months ago. We tried out a lab rescue group, but they were hesitant to adopt a more outgoing lab to us since we have a beagle. Our beagle Leia is used to being around large dogs (we have a 12-year old lab mix and recently lost an 8-year-old 50-lb beagle/lab mix). They wanted to adopt a dog to us that was more mellow than we wanted. It seems that no matter what I said about how our beagle is super active, they saw how cute she is, so they were falsely worried. So, we decided to go with a lab mix puppy and brought Jango home at 8 weeks old (started with foster-to-adopt until he got neutered at 12 weeks). Jango was born in the rescue, as his mom was found as a stray while she was still pregnant. Jango just turned 6 months old, and he and Leia are best buddies. He is so sweet, outgoing, friendly, and smart. It was a great choice for us. Plus, the two cats got to put him in his place while he was young. In response to Tammy’s comment re not running with a young dog, breeders sometimes have older dogs available that for some reason did not make it into their breeding program, or who have been returned for non-health related issues (my friend just had two one-year old litter mates returned because the people had no time for them, and part of her contract states that dogs are to be returned if a purchaser has to give one up). I appreciate the freedom of choice; thus obtaining a dog from a responsible breeder is also an open option to me. Thanks for this interesting topic and all experience sharing comments; and I wish Lindsay could find the ideal Ace’s new companion either a Weimaraner or others (Vizsla, German Shorthaired Pointer, Poodle, Airedale Terrier, Dalmatian, Border Collie or Rhodesian Ridgeback are all my favorites.) I guess that with Lindsay’s expertise and pet caring experience, all the above mentioned breeds could be good a running partner, I guess as my being a first time dog owner. I was lucky (understand this just recently) how lucky I was having adopted my first dog, a female Rottweiler then 1.5 years old in July 2012, at San Diego’s Animal Control Service shelter in Linda Vista. It took me just 30 minutes (before the shelter’s closing time) without knowing what a Rottweiler breed was, just having learned the name while searching on the internet for the healthiest dog breeds a week before my first visit to the shelter. Rottweiler dog is listed as number 2 healthiest dog breed on that list immediately following the mutt. My Rottweiler is healthy, calm, gentle, quick in learning and having guarding instinct. I really like vizslas and German shorthairs too. One of my BFFs runs a rescue and she had two dogs from reputable breeders. We used to tease her about it. She adopted her first puppy last month after one of her dogs passed away. From her, I learned that it doesn’t matter where the dog comes from, it’s about giving a dog a safe and happy home. I’m happy that I’ve learned how to spot a good breeder and have two that I want to work with should that day come. There is absolutely nothing wrong with a rescuer wanting a well-bred puppy from a responsible breeder. I would love to get a baby with excellent genetics, from health and temperament tested parents. Good, responsible breeders are not the reason dogs are in shelters. Good for you, and good luck! Can’t wait to see what/who is the lucky dog to join your family! It is crazy, how some people are overly fanatic about either breeding or rescueing. I’m glad to hear, that you have noticed, that both can be good or bad. Some people don’t seem to realize, how both sides have the “good and bad”. Mostly I’ve seen, how rescue people go on and on about breeders being terrible, and how they add too many dogs to the world. But actually, it isn’t the responsible breeder, who chooses to let the dog go on the streets – its the irresponsible dog owner. People should consider promoting responsible dog ownership more, bringing out the ups and downs of dog owning more openly etc. Maybe then we would have less homeless dogs, less irresponsible breeders, bad rescues, irresponsible dog owners etc. Maybe then people would realise, that dog owning can be challenging. That it takes time, it isn’t just a walk in the park, that it is a commitment. I’m planning on getting my second dog (fourth to our pack) next year, when a certain litter is born. I’ve already been planning on this for nearly two years, but there is still so much to go through! I’ve already found a fantastic breeder, and been in contact with her regularly. Even if this future litter won’t have my future dog, I know exactly, who I want to get my next dog from. Responsible breeding with open views is something I really want to support, so that we have healthy dogs in the future. This is a great article. I have experienced the exact same thing. I re-homed my last dog after realizing I was trying to force a square peg into a circle hole. While I don’t regret my decision, it was very painful and it forced me to be completely honest with myself about the type of dog I want and need for a successful companionship. I did my due diligence in visiting the local and surrounding shelters looking for pups that aligned with my preferences. I was also rejected by two rescue groups. In the end I found a breeder for a Cava-poo-chon. While I would have loved to adopt another dog (and another pit), I didn’t want to adopt the WRONG dog just for the bragging rights. And ultimately, I think that’s why some people turn to breeders. Because sometimes the dog you need is not among those up for adoption, and sometimes your preferences are non-negotiable. I never want to re-home a dog ever again. Going to a breeder is one way to help ensure I get as close to my perfect match as possible.